Admit it: if anyone looked through your YouTube history, you’d probably end up on a watchlist of some sort – or at the very least, your friends would think twice about spending time with you if they knew what sort of kooky, skeezy, fucked-up stuff you enjoy streaming in secret. Thankfully, that’s all of us: a quick survey in the TNW newsroom revealed all manner of unnecessary viewing, like this ancient Vine, this way-too-slick clip of beetleweight fighting robots, this primate peeing into its own mouth, and this dude delivering the most profound monologue ever while enjoying an LSD trip in the Thar desert. And yes, of course there’s more. So yeah, no judging. 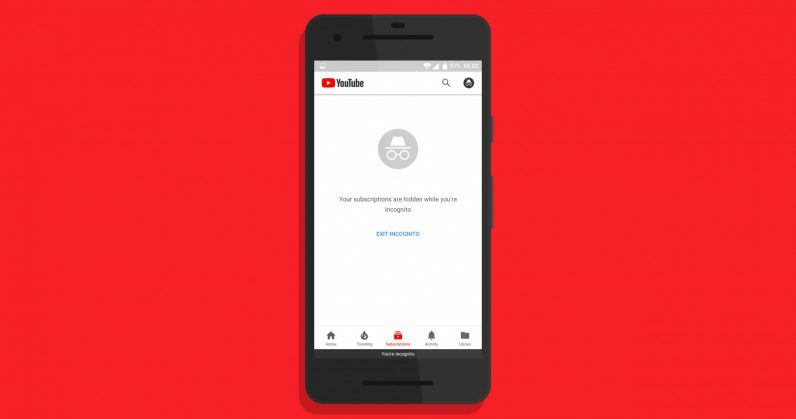 If, however, you’ve been hoping for a way to continue your oddball spirals down into the dark and rarely explored corners of YouTube, you’ll be happy to know that its mobile app might soon get an Incognito mode. That’s according to the folks at Android Police, who have spotted the feature in the wild. When it arrives (it’s likely a server-side change that won’t require an app update), your viewing history from the current session won’t be saved, and it seems that your subscriptions won’t be tainted by your disgusting choices in entertainment. Plus, your existing subscriptions will be hidden from view too. That’s a lot of words to tell you that a minor new feature is coming to an app, but it’s one that we’ll all benefit from. To its credit, YouTube has been getting better at understanding which videos are absolute garbage and shouldn’t be recommended on its home page, but I still shudder at the thought of people discovering my abhorrent taste in videos. It’s worth noting that YouTube’s mobile apps already let you pause your watch history and search history by finding those toggles in the settings menu, but we could certainly use a quicker way to indulging our bizarre side. If you’re listening, Google, we’d like that incognito setting right away, please; feel free to put dark mode on hold if that helps.